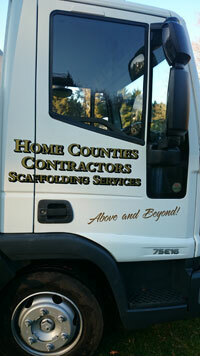 Welcome to Home Counties Scaffolding! We are a Newbury based firm offering both commercial and residential services across Berkshire, Hampshire, Oxfordshire, Wiltshire, Surrey and further afield. Home Counties can offer scaffolding services for re-roofing, extensions, chimneys, painting, refurbishments, new builds, hand rails, birdcages and more. To enable us to offer the highest standards our Supervising Scaffolder Carl oversees each and every job we do. Carl has over 10 years’ experience in the trade and his enthusiasm along with extensive knowledge of scaffolding techniques and services complements the high standards we always strive to deliver at Home Counties Contractors Ltd. Accordingly, we have amassed a comprehensive portfolio of equipment and are constantly adding to our stock enabling us to undertake the most demanding of projects.